3-IN-ONE's unique set of ingredients enable it to lubricate, clean and protect metal surfaces. 3-IN-ONE's easy-to-use drip spout allows you to apply the product right where it's needed most. 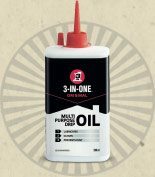 3-IN-ONE oil also offers you different application solutions to treat your tools and home, office and sports equipment.